Tivoli can be described as sleepy during the day and pretty lively at night. But that doesn't mean you can't get some cool shopping in. Stroll through the village and grab some unexpected finds. This unique bookstore offers a focus on poetry, literature, art, design, photography and film. Specializing in used and out of print books, they also carry a tight selection of new books. The space is also home to The Brother In Elysium publishing imprint and letterpress studio, and hosts film screenings, poetry readings, and art events. Open five days a week, with new inventory weekly - and always actively buying books. Fabulous Yarn is an independent luxury yarn and fiber shop known for extraordinary customer service and one of the best selections and supplies anywhere - all at discount prices. With a huge range of fabulous hand-spun, handmade and unusual yarns plus needles, bags and more, Fabulous Yarn has everything needed by the discriminating knitter and crocheter. Great for gifts. The Corner Store offers a curated selection of tribal, textiles, and handmade items - global and local. Featured artisans include John Corcoran, Fahari Bazaar, Anne Halle, and Caroline Wallner. 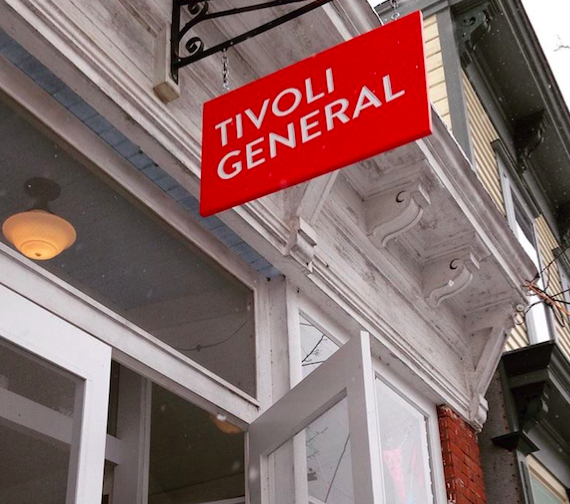 Tivoli General offers high quality groceries and necessities in the center of the village. We feature products produced on our farm, including pastured pork and lamb, fresh free-range eggs, maple syrup, jams and seasonal produce, as well as carefully curated items from local craftspeople, farmers and small food producers. You'll find imported specialty goods, spices, general supplies, last-minute finds, fine beers, local artisan fare and more. What started as a hobby has now become a passion for the owners of Tivoli Wine and Spirits. Try wine from many regions, including organic or Kosher selections, or single-malt whiskey, local distilleries and more. You’ll find a wide and eclectic selection in this boutique location. Opening Memorial Day weekend. Tivoli Mercantile is a little shop carefully curated by Jill TerMolen-Cornillon and offering a mix of home goods, clothing, jewelry, apothecary items, books, toys and more. Basically a collection of Jill's very favorite things, with a little something for everyone.